Today’s tutorial is brought to you in video form. The video begins with an explanation of all the materials that you will need to complete your polymer clay texture plate. After the presentation of materials, you will see the entire process of creating a texture plate in fast motion with embedded instructions. This Christmas my hubby bought me a new sketchbook. So, I’ve been doodling … and doodling … and doodling. 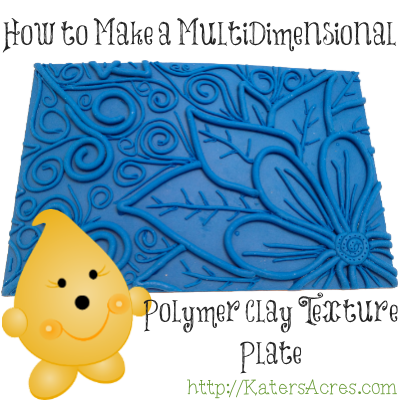 The result was the inspiration for these multidimensional polymer clay texture sheets. These have many uses from polymer clay, to stamp-able images, to mica shift splendors! Here’s the idea: With these multidimensional texture sheets, you can create a single layer of depth, or multiple layers of depth. With the texture plate that I created the flower & leaves are the first “depth” of the design. You can use simply the flowers & leaves. Or you can impress the clay further into the texture sheet and pick up the second layer of swirls. And if you desire to see every image on the texture sheet, simply impress the entire sheet into the clay. A Note for Proper Use: For proper use of the multidimensional polymer clay texture plates, you will need to place the texture sheet face up on your work surface. Then lightly cover it with corn starch. Place your clay sheet on the texture plate and press the clay onto the texture sheet. This will allow you the greatest amount of control of your texture sheet and your clay. The piece shown at right is the original (positive) image for my texture plate and the image at the rightmost of the photo is the reverse (negative) of my texture plate. This texture plate was made for the Polymer Swaps Group on FaceBook and sent to Claire in Canada! No problem – I’m glad you enjoy it! Katie you are awesome. Thank you so much for sharing all this great information. You are very welcome! I appreciate you taking a moment to say so. Enjoy making your texture plate. I hope you make lots of them! That’s a beautiful texture sheet. It’s wonderful of you to share. Thanks! You’re welcome! I encourage you to try and make your own. They are a lot of fun! You can make and use texture sheets at any size/shape you want. The choice is yours Carol. Great idea for pottery design also. Stoneware clay dries out too fast to do detailed extrusion patterns. Much better than the hot glue designs I’ve seen. Thanks. Thank you Marilyn! I hope you try this project. Урок. Текстуры для полимерной глины. - Блог о творчестве и рукоделии. That is just fabulous! Can’t wait to try it!